When you hear the words “The Boss,” a few things come to mind. From being overworked and underpaid to striving to make things perfect, most people associate it with a form of stress. For 32-year-old Carlos Cruz of Pembroke Pines, Florida, the words have a different meaning. 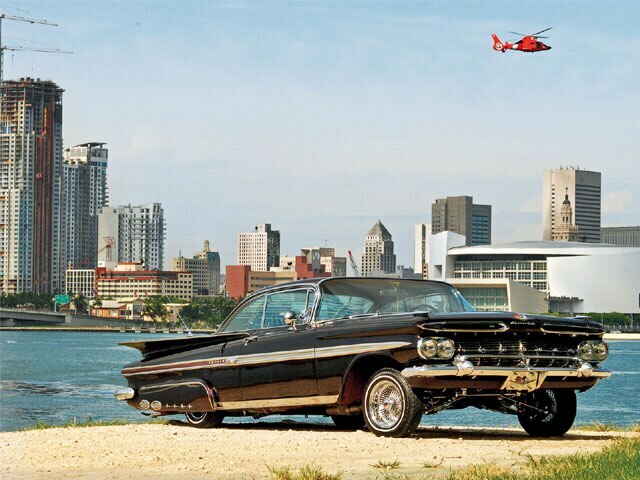 It all started five years ago when Carlos was cruising eBay ads and came across an immaculate ’59 Chevy Impala from Oregon. 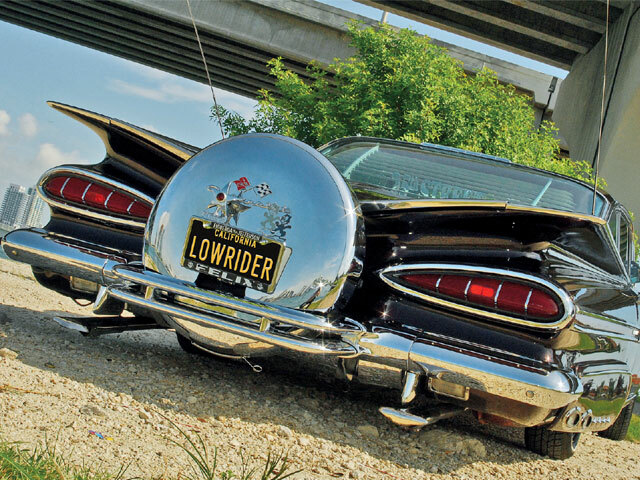 Carlos had his sights on the ’59 body style since he was a little kid and his savings allowed him to pursue this one-of-a-kind gem. After he laid out the hefty 30-large to purchase the mint vehicle, “The Boss” began to come to life. 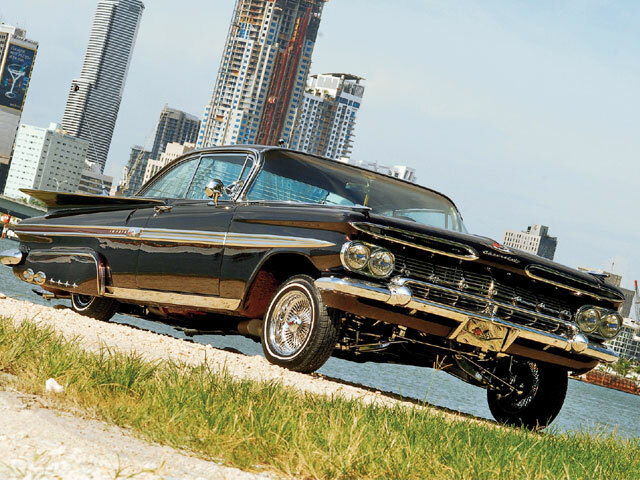 Debating whether to go the restoration route or lay it low, Carlos opted for the sleek ’59 to take charge of the lowrider show circuit. 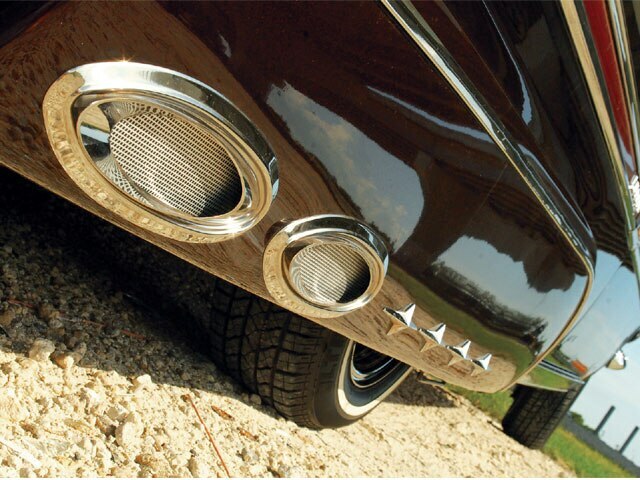 The first step was enlisting his good friend Kioni Teixeira of Hollywood, Florida, to add a custom French antenna along the passenger side above the rear wheel. 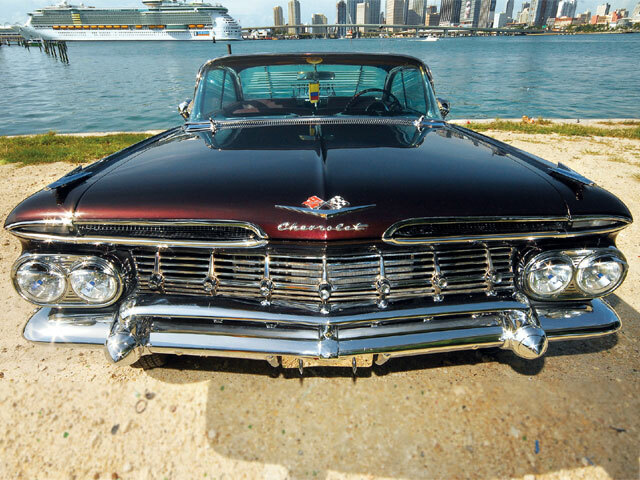 The Chevy was brought into the paint booth and Kioni coated the ’59 with layers of rich black cherry metallic paint. Carlos, an electrician by trade, knows his way around wiring. 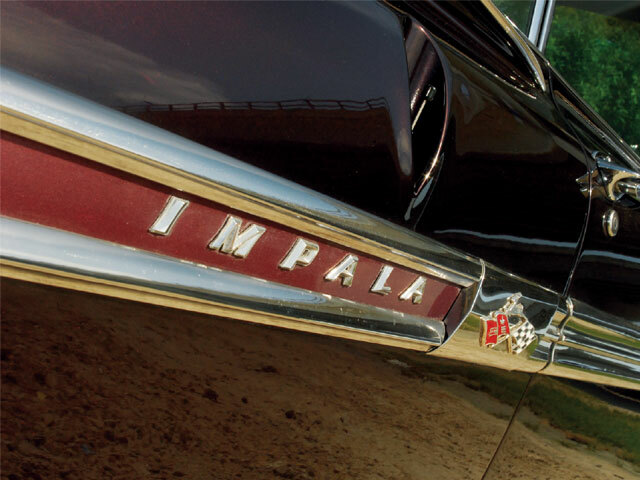 His knowledge helped him under the hood to tune up the powerful V-8 and Turbo transmission. 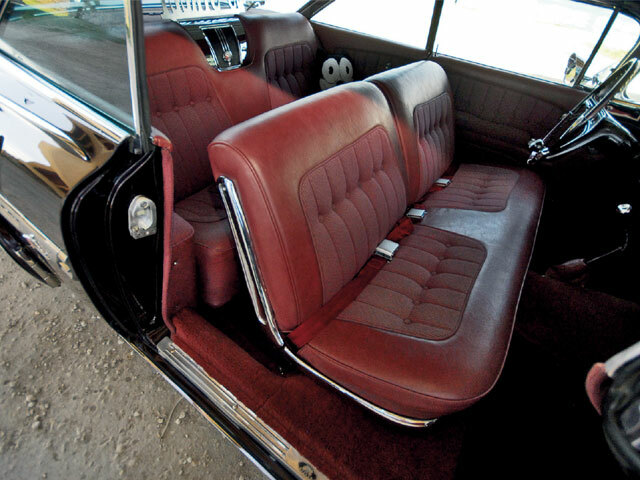 That led him to Kenny’s Upholstery in Hallandale Beach, Florida, where the interior experts wrapped his classic in peach tweed and vinyl. 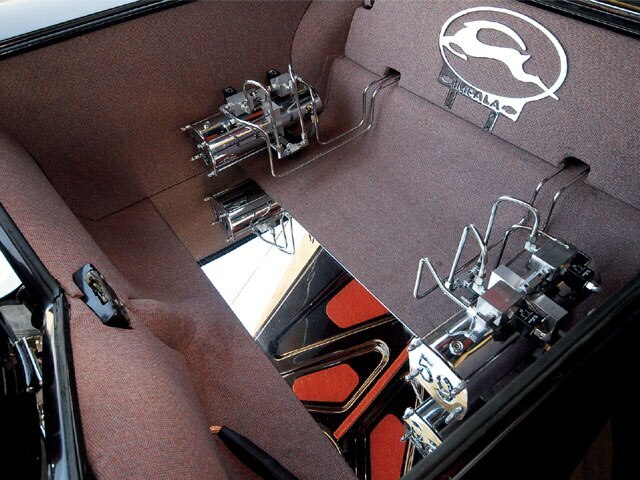 The fabric follows the Impala straight back to the trunk where David “Martian” Holtzman and James “Mopar” McHugh laid down a clean hard-lined two-pump setup controlled by the switch deck mounted on the dash. 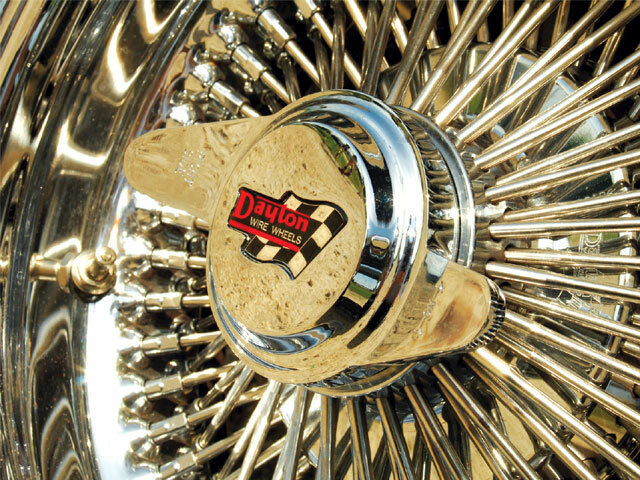 The stress points were all reinforced and the final touch was a set of 100-spoke all-chrome Dayton wire wheels wrapped in Hercules rubber. 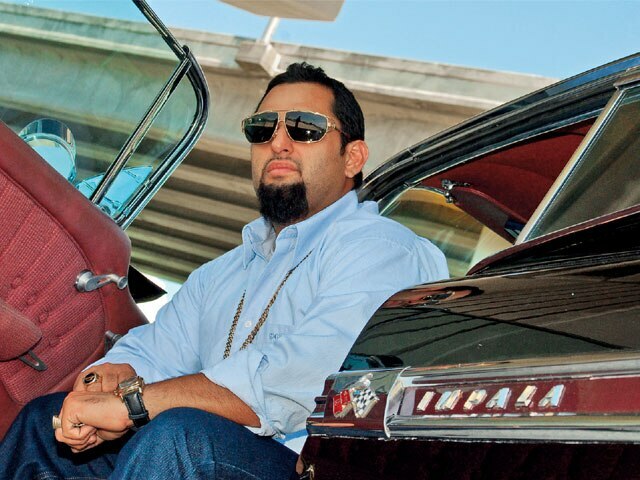 Carlos grew up customizing lowrider bicycles with the dream of one day having a vehicle that would be respected enough to grace the pages of Lowrider Magazine. With help from his car club, 25th Street Riders, and his loving and understanding parents, he has made that dream a reality. “The Boss” has already earned top honors at shows throughout the state, but Carlos has no intent of stopping there. Expect to see this ’59 ruling the show circuit for years to come. Engine/Drivetrain: Carlos handled the dress-up of the original 348-c.i.d. W-series Turbo Thrust V-8 himself, changed the timing chain, intake and cam. 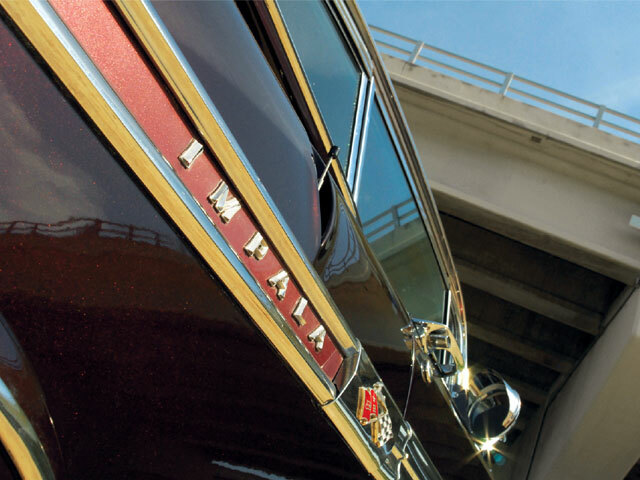 Imperial Plating in Miami, Florida, took care of the chrome. Body/Paint: Fellow 25th Street Rider member Kioni Teixeira of Hollywood, Florida, laid down coats of metallic black cherry paint over a rich black basecoat. A Frenched antenna was molded in the body behind the passenger door. David “Martian” Holtzman at McHugh’s Auto Body in Hollywood powdercoated the undercarriage and reinforced the stress points. Interior: The seats were done at Kenny’s Upholstery in Hallandale Beach, Florida. Peach tweed and vinyl make up the custom look and balance the colors of the exterior. 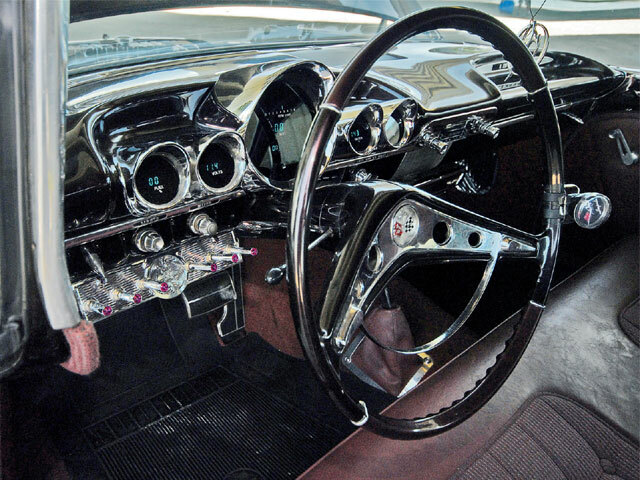 The original dash was cleaned up and the stock gauges were replaced with Dakota Digital gauges. Tweed fabric was used to line the trunk and headliner. Sound System: “Martian” of McHugh’s Auto Body received the honor of placing in a Custom Autosound head unit to keep the original stock look. The rest of the stereo equipment was hidden, including a 500-watt Pioneer amplifier, and four JL Audio midrange and high-range speakers in the rear deck and kick panels. One Pioneer subwoofer was mounted behind the rear seats. Setup: James and his partner Dave worked endlessly on a classy CCE Hydraulics two-pump, four-dump setup with all-chrome hard-lines and custom “1959” backing plates. 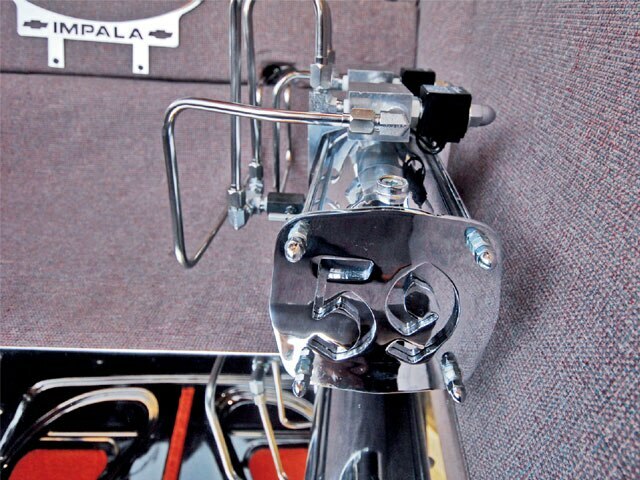 Two 8-inch CCE cylinders in the front and two 10-inch in the rear are hooked up to six dash-mounted switches powered by six gelcell batteries. 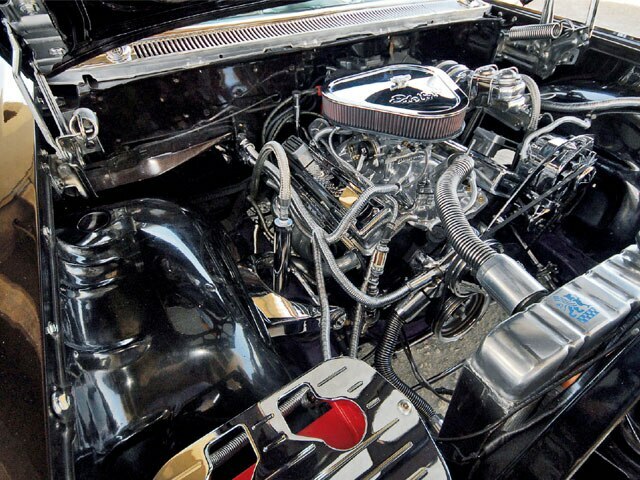 Chrome 3-ton springs were set in place to handle the weight of the classic Chevy.